Fort Benton, Montana Territory, was the last port in the upper Missouri River at a time when the majority of the freight going to the Dakota and Montana territories was carried by river boats. After the Northern Pacific Railroad arrived in Bismarck, Dakota Territory, the river route got a lot shorter. The freight was unloaded from the trains and onto one of several river boat companies operating out of Bismarck, the largest of which was the Fort Benton Line. Charles E. Conrad was a Montana Pioneer, banker and Missouri river trader. Conrad was also involved in the freight business which flourished in the 1880s for about a decade. At the same time, he served as vice president of the First National Bank of Fort Benton, Montana Territory. This rare $5 1875 Montana Territorial note features Conrad’s signature. 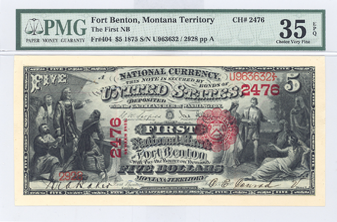 As of February 2010, PMG has graded only one Montana Territory note from Fort Benton. As you can imagine, running a river boat line from Bismarck, Dakota Territory to Fort Benton, Montana Territory was very risky. Some of the problems included low water, boiler fires and obstacles in the channel. The main problem was that the river was frozen for at least four months each winter. Shortly after the railroads extended into Montana, most of the river boat companies ceased to exist. Mr. Conrad moved to Flathead County in northwest Montana around 1890 and started the town of Kalispell. 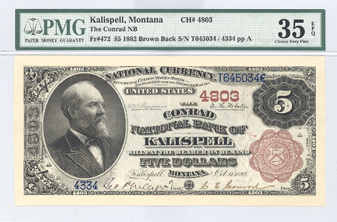 In 1892 he chartered the Conrad National Bank of Kalispell. This $5 1882 Brown Back National Bank note also features Conrad’s signature and is equally as rare. As of February 2010, PMG has graded one example at the 35 level and only 19 higher. To say the least, the banking business was good and soon Conrad’s bank was the largest institution west of Great Falls. After he died, his family continued to operate the bank for decades. His former mansion in Kalispell, built in 1895, is now a museum. In 1863, after 80 years of solely state regulation, the federal government began chartering and regulating banks. The National Bank Act of 1863 offered banks the choice of having a state or national charter. The federally chartered national banks had the power to issue standardized national bank notes based on the United States bonds held by the bank. The government assigned each national bank a charter number which appears on the bank’s notes. The charter numbers for the above referenced notes are 2476 and 4803 respectively. One of the reasons Congress created a banking system that issued national currency was to finance the Civil War.